Sure, it's pretty. But does it do it for ya? And even so, sometimes I really want to be disconnected from the world but it’s nearly impossible these days. Just as I was trying to find a balance between all the work I have to do for my job, the personal work I’m doing in my spare time, all the growing piles of mags and books waiting to be read, the TV shows accumulating on my DVR, and of course, the Internet– along comes the iPad. Let me preface this with the fact that I’m very well aware that I have absolutely no need for this technological beast in my life. And I would have never actually paid $600 for this completely unnecessary addition to my world. But, seeing as though I was pleasantly surprised with it as a gift, I must admit that it makes a fantastic backup to my elderly MacBook should it ever choose to croak on me in the near or distant future. 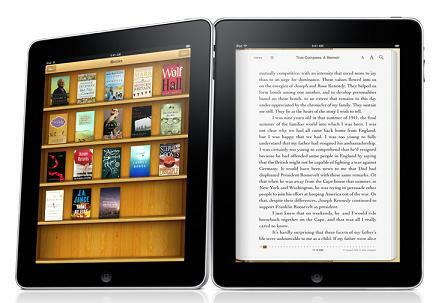 As much of an Apple fan as I am, I’m just not into the whole reading a book electronically thing. I’m a writer (translation: nerd) who worships the written page. My fingers eagerly glide through the pages of every new book I happen to pick up while the smell intoxicates my senses. Okay, that’s a bit dramatic, but it’s true. I suspect not everyone appreciates the subtle intricacies of the average bound book, but it’s hard for me to assimilate to the idea letting a touch screen replace that feeling. I cannot lie. My iPad is pretty amazing and beautiful. And I’m sure it’ll be great when traveling since it’s so much less bulky than carrying my laptop and/or multiple books. But as awesome as it may be, I’ll still miss the smell of those pages–even if paper cuts will be out of the picture. Tags: distractions, iPad, reading, technology. Bookmark the permalink. It’s so techie and shiny! Ohhh! I’m a little jealous!